This giveaway is a little different that what I've done in the past, but when I was approached about reviewing a CloudPet of our own, I kind of fell in love with the idea behind them (and was so thrilled I would be able to give away not one, but two to my readers!). Eisley loves hers, which she has somewhat unsurprisingly named Cinderella, and I'm excited to know that two of you will receive your own to either keep or give away to a child you love. 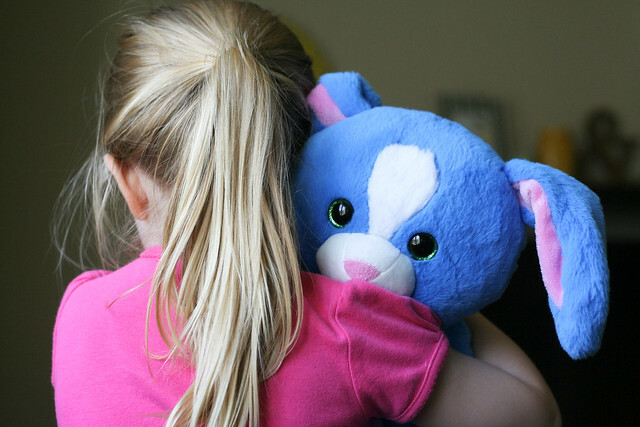 Basically, these stuffed animals—you choose from bunny, cat, bear or puppy!—can both send and receive voice messages (up to 10 seconds per message) through a free app you download onto any smartphone. When a message is received, the heart on the front of the pet lights up, and the child can press one of the paws to hear the message. (It's kind of amazing how clear the messages come through!) The child can also easily record a message of their own to send back by pressing the other paw and simply speaking to the pet. The recipient will then receive the message through their app, which they can then listen to. You can give your child's account information to as many people as you want, so they can receive messages from any number of friends or family members! It is also secure, because only those invited can send messages to the child, and every message must be approved by the parent (via the app) before the message is sent to the CloudPet. The retail price runs higher than I would normally pay for a toy ($39.99) but I personally feel like this would be a fantastic gift idea for grandparents who love to splurge (and perhaps live far away from a grandchild!) 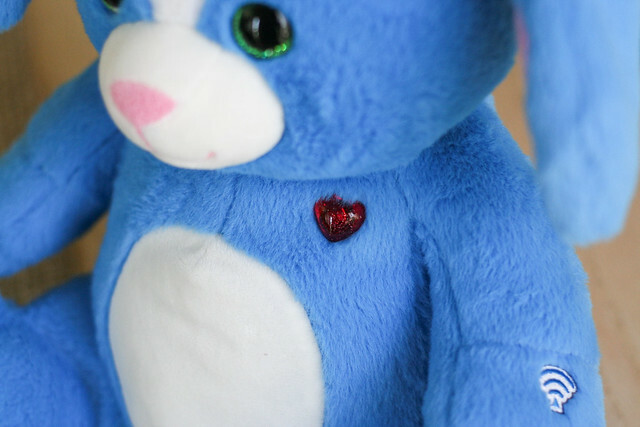 or a comforting, unique gift for a child who has a parent who is deployed or is often away. I love having one for Eisley, because so many of our relatives live states away from us, and this is such a sweet way to send and receive little messages! I'm excited to encourage those grandparents, aunts and uncles to download the app, too, so they can start sending her messages. One thing to keep in mind is that there is a plastic base on these stuffed animals (for the battery pack) which means it may interfere with the cuddle-factor of the pet—but my daughter still begged to sleep with hers at nighttime, so it didn't bother her at all. Also, you do need to have an internet connection to send or receive messages. 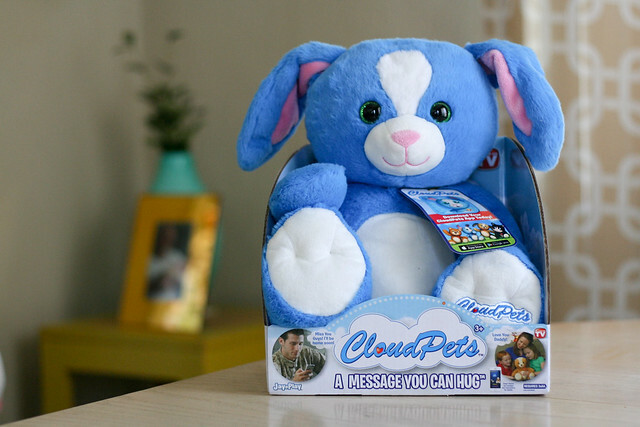 Although you can receive messages from anywhere in the world, the CloudPets themselves sync with the app on the parent's phone, so it must be within 30 feet from the phone to send the received messages to the actual CloudPet. For more information on this product, you can visit their website here and view their FAQs here! If you'd like to enter to win one of these CloudPets, simply leave a comment on this post sometime before Monday, June 1st! Next week, two winners will be chosen—so be sure you have an email connected to your commenting account, should you win! Please note that this giveaway is limited to US only, and the winners will be able to choose from whichever CloudPets are currently in stock and available to ship immediately. The giveaway is now closed! As always, I used the handy random number generator on Random.org to choose the winners. Congrats to the following commenters: Vanessa G. and Christine W.! 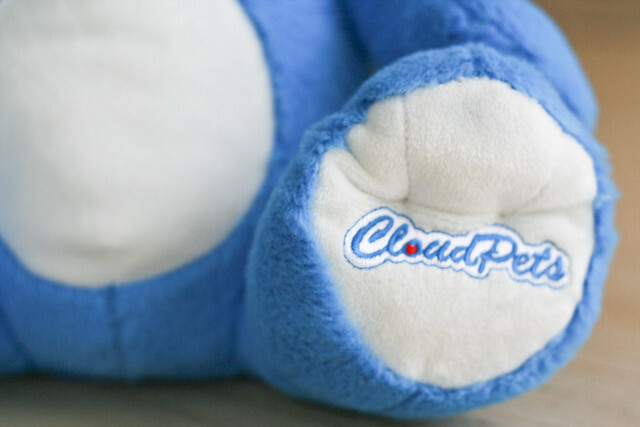 I will be contacting you this week so you can receive your CloudPets as soon as possible! And thank you to everyone who took the time to enter the giveaway. I received a free product in return for this review and hosting a giveaway, but all opinions are my own. View my disclosure policy here! Very cool! I bet Meredith would LOVE this. Also - how adorable would it be if two kids were sending messages to each other! This is such a cute idea and I didn't know about it. My family is spread across two continents and three states. We are all starting to have young kids and I'd love to win one! My little nieces pieces would adore this! Both her dad and I travel every week, and it would be so cool to have another way to keep in touch! I would give this to my goddaughter, Ella. I'm sure she'd love getting my messages so much. This would be so nice to send to my niece Delilah who lives far away. Thanks so much for the chance. Have a great weekend everyone! OMG, this is such a good idea! I want it, I want it, I want it! I travel a lot for work and think this would be a great way to keep in touch my kids while I'm away! Selena has been begging for one of these! She reminds every time she sees a commercial! When I said no Michael said he wants one, Lol! I guess if we don't win one I am bound to buy it! This is amazing! I have a son born the same month as Eisley and he would go nuts for this. He tells everyone he is a cat and we are a cat family (we do not own a cat)! This is so cool! My daughter would love it! Oh this is adorable! My husband is deployed and this would be the sweetest cuddly toy for our daughters! My daughter would love this! And I would too on days when I have to work the overnight shift. Such a wonderful idea! This is the coolest idea! I love it!! That is so sweet! I would totally get one of these since we move so much for the military. Would be awesome to get message from our family and friends all over! I ordered one of these for my two year old to receive messages from my husband during the upcoming deployment. We have another child on the way, and I would love to have one for him to receive special messages from daddy, as well. Would love to have one for my mom and daughter to talk to each other. We all live so far away from each other and my daughter misses her all the time. This would be so nice to have!! Awesome product! Can't wait to see my girl with her own Cloud Pet!! These are so cute! Thanks for doing the giveaway! We would love to have this for our child my husband is in the army and is gone a lot and I have a lot of health issues and im in and out of the hospitals and in bed rest a lot so this would be. Awesome way to uplift his days !! We have seen it on tv but the price is so high and we just don't have it but you can't blame them it's such a great gift and toy for children it seems worth every penny !! We would love to win one and surprise our child good luck to everyone and also you are doing such a great thing !! Would love to gift one to my nephew! This idea is so awesome! My husband works far from home & this would begreat for us! So cute!! What a great idea :) I'd love to get my hands on one for my son! What a great idea! My son would love this! Oh my goodness! My girls would just LOVE these. Thank you for the wonderful giveaway. MY BEAUTIFUL DAUGHTER LAUREN WOULD LOVE THE CLOUDPET BUNNY EVER SINCE SHE SAW IT ONLINE SHES BEEN PRAYING I BUY HER OWN ASAP. THANK YOU FOR GIVING MY DAUGHTER A CHANCE TO WIN ONE. This is such an amazing idea for any family. I work so much and would love to have this for me and my daughter. What a great toy! This would be perfect for family far away. Would love to win this for my daughter. Her daddy travels most of the time for work and this would help her when she misses him the most.